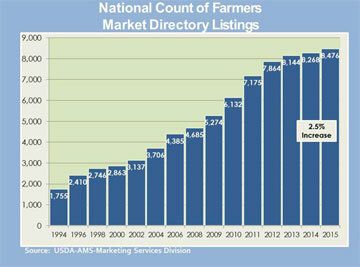 The National Farmers Market Directory (NFMD) helps connect growers, vendors & various small businesses with consumers in their own local community. Many farmers markets will include farm animals for kids and host fun activities so that the entire family can enjoy the experience. The Farmers Market Directory provides consumers with convenient access to information about farmers market listings such as location, operating times, reviews and more, to better connect farmers & buyers, and enhance awareness of available local food sources. Who Benefits From Farmers Markets? Farmers markets are usually the first point of entry into the marketplace for small and mid-sized producers. They help small & medium-sized producers grow their businesses, develop and test new products, and obtain a reliable source of income. Farmers markets allow consumers to have access to locally produced, healthful farm-fresh food, develop face-to-face relationships with the farmers who grow them, and the opportunity to contribute directly to local farm viability. Farmers markets often serve as an integral part of creating robust local economies, thriving neighborhoods and vibrant civic design plans. They also provide easier access to fresh, healthful food in communities where access to fresh, nutritious food may be limited.